Farmers, airlines, and manufacturers lock in their costs for commodities by using the New York Commodities Exchange (COMEX). Rather than speculating, they buy and sell commodities to hedge their costs. On the other hand, the majority of those who buy/ sell gold and silver derivatives are short-term speculators [Exchange Traded Funds such as SLV and GLD, options, and futures contracts— NYCOMEX, Euronext, etc.]. Buying or selling on margin gives speculators tremendous leverage (margin requirements vary). The usual gold or silver buyer is not interested in acquiring actual bars, but in making a quick profit. 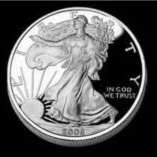 The buyer of one silver contract is long 5,000 ounces of silver. The buyer of one gold contract is long 100 ounces of gold. To complete the transaction, what is purchased must be sold. The buyer profits if he sells the contracts at higher gold/ silver prices. Commodities investors/ traders can also take negative positions. A short-seller sells what he does not own. To fill the contract, he must buy back what he originally sold. A short-seller makes a profit if he can buy the commodity back when the market drops. The shorts profit if they can buy the commodity back when the market drops. If they misjudge, and the market goes up, they either cover their shorts, and take huge losses; or they pay margin calls, and hold on to their contracts with their teeth gritted. They are leveraged- with a certain percentage down, controlling 5,000 Troy oz of silver per contract, or 100 Troy oz of gold per contract. There is a delivery month when a commodity contract expires. In theory, all buyers can pay for contracts in-full and take delivery of the silver/ gold. In the past, it was possible for anyone to take delivery of silver on the delivery date of the contract. That is no longer always the case. Shorts are squeezed during rising markets when covers are impossible to find to close out their short positions. It is called fails to deliver when bullion houses are unable to secure the silver (gold) to fill delivery orders. (The COMEX can limit delivery of silver to 1.5 million ounces to any individual.) When demand overwhelms supply, the exchange has a clause that allows for a cash settlement, instead of delivery of the physical metal. The default-mechanism for fails to deliver is cash-settlement. Since 2011, delivery contracts have been quietly settled in dollars rather than in precious metals. Industry watchdogs say cash-settlements are getting larger and more frequent. It is rumored buyers who are legally contracted to take physical silver delivery, instead, are paid dollar premiums as high as 20-30% as an incentive to settle. A commodity short-sale is “naked” if the seller does not have the goods to fill the contract. If he sells silver or gold without insuring it can be borrowed or secured, the corresponding half of the transaction cannot be fulfilled. The naked short-seller cannot fill the order because the commodity is not available. Naked short-selling drives down prices to levels that do not reflect true supply and true demand. Bullion banks are members of the London Bullion Market Association (LBMA). Bullion banks are investment banks that function as clearing banks – wholesale suppliers of gold and silver bullion. The banks conduct the financial transactions and ownership transfers of precious metals from central bank inventories — most often, gold and silver that has been leased, swapped, rehypothecated. Banks such as JPMorgan and HSBC perennially hold massive short positions in gold and/or silver. There are no COMEX limits on speculative positions except in the spot delivery month. An unlimited number of contracts can be sold short. Currently, JPM, HSBC, and other bullion banks control the open interest on the COMEX with an unprecedented number of silver short positions (number of incomplete transactions). Billions of dollars worth of silver must be purchased or delivered to complete the outstanding transactions. owe more silver than exists above ground. Since 2007, global central banks (especially in Asia) have been gradually unloading dollars on the exchanges. Instead of taking their profits in dollars, mega-buyers have been paying off contracts and taking delivery of massive tonnage of physical metal. When silver (or gold) breaks to the upside, the bullion banks increase their naked short positions to suppress the price. for gold and silver is causing tremendous volatility. We are just one crisis away from a run on PHYSICAL silver and gold. All it would take to trigger a default-event is for one large bank or country to refuse cash settlement and demand actual silver (gold). Currencies and entire national economies can be –and have been- brought down by naked shorting. The practice threatens broader markets, and could be the catalyst to shatter global confidence in the dollar.